Chocolate Azuki Bean Soufflé Cake - Do You Know The Muffin Man? 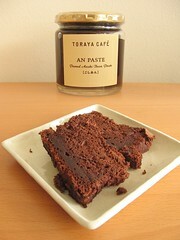 Notes: After tasting the wonderful cakes at Toraya Café, I wanted to try reproducing them in my kitchen. Armed with an ingredient list and a jar of their an paste, I tried modifying a chocolate chestnut cake, substituting sweetened, puréed red beans for chestnuts. I scaled back the sugar and increased the flour slightly to compensate for the taste and consistency of the sweetened, puréed bean paste. Instead of a round cake pan, I baked it in two 8×4" loaf pans. The loaves were a bit on the wet side and dense on the bottom; perhaps a cake pan is the better way to go. Flavour-wise, it was mostly chocolate with a faint taste of azuki bean. Toraya makes two versions of this cake, one they call gateau and another called fondant; this was more like the latter (brownie-like) while I was aiming for the former (drier). More experimentation to come.